[New for 2012, Discontinued by 2014?] 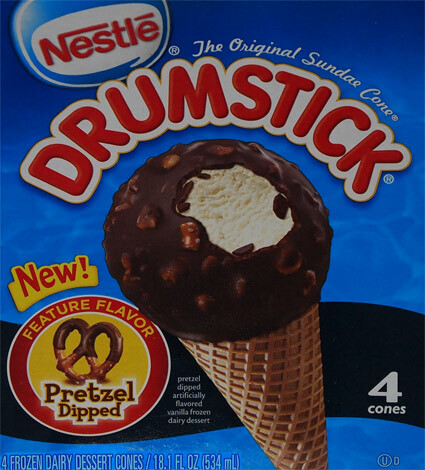 Now Nestle released a handful of new drumstick and bar products last year, and the ones that really got my attention were the two treats involving pretzels. Now I try not to read ice cream reviews before trying a product myself, but I did read that Brand Eating was rather unimpressed with the caramel pretzel ice cream bar. His biggest complaint (and my worst fear) was that the treat really didn't bring the pretzel flavor. Well, let's see what happens here. So here is a box of Pretzel Dipped Nestle Drumsticks which is pretzel dipped artificially flavored vanilla frozen dairy dessert... wait, what? 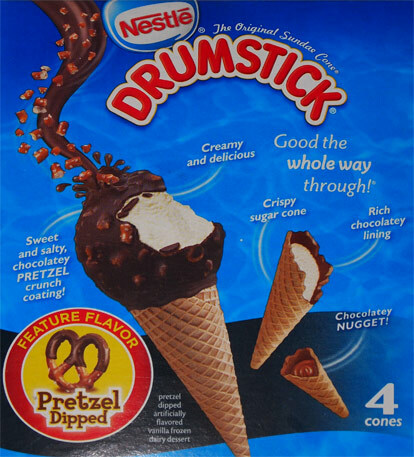 GRRRRRRRRR Nestle has put frozen dairy dessert in my beloved drumsticks? Ok, looking back to the 2009 review of Lil' Drums, this indeed has been the case for a long time. Apparently it's been too long since I've had a drumstick. Let's proceed. Now if you've somehow made it through life without trying a drumstick, let me point you towards the back of the box. 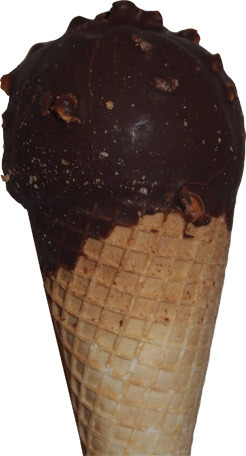 We've got a pretzel filled chocolate coating on top, "crispy" (crunchy) chocolate lined cone, and the always welcome chocolatey nugget in the bottom. Now some people might choose to savor the treat they see before them, but not me. No no, I go right for the crunch and proceed to devour all that is before me. It doesn't look like a ton of pretzels, but let's check the taste. Now it's not real strong, but I'm definitely picking up some light salty notes. The pretzels are adding some crunch, but not a ton of flavor. It's probably too much to ask, but it's a shame it's not crushed pretzel and pretzel bits to really help spread the pretzel flavor around. 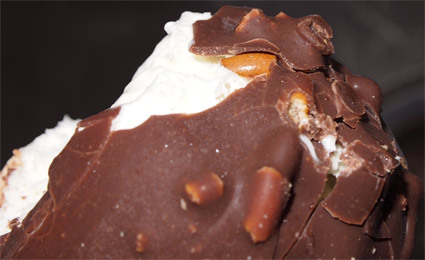 Now once you get past the chocolate fun on top, this one is just a regular vanilla drumstick underneath. Now this is usually the part where I rant about it being a frozen dairy dessert, I mean, just look at that funky air filled texture... but I'm not going to complain today. 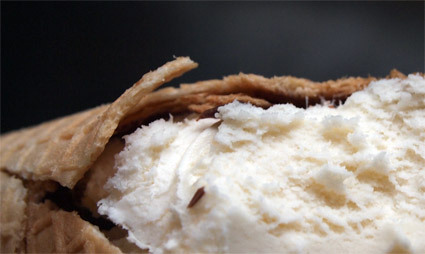 You see, not only do we have the crunchy cone to cover up the texture, but this base vanilla has a nice strong flavor that I'm really appreciating right now. I finish up my cone and while I'm satisfied, I'm a little sad the pretzel fun didn't continue throughout the entire cone. I know it would be hard to do, but geez, I'd be happy if there were just a few more pretzel bits in the chocolate nugget so that my final aftertaste had a note of pretzel to it. Now keep in my mind that all these thoughts are coming from a pretzel addict. Where as I want to be swimming in a sea of pretzel goodness, Drumstick has come along and said "let's do a hint of pretzel". It makes sense, the treat is more universally appealing that way, I just like to comment. Do I have real complaints? Well, I'm not really filled, but that kind of always happens when I have one of these. I love drumsticks and I always want another. The funny thing is when my daughter says the same thing.... must not do second scoop right now.... must resist. Just had a brilliant idea to continue the pretzel flavor. They should have used a pretzel cone instead of the normal one! hahahaha, yeah, I was thinking the same think (forgot to mention it in my post). I know it would make production hard but it would be so cool to have a nationally available pretzel cone treat like that. I actually thought that's what they did with this treat! I;m not nearly as bummed about not finding this one in stores then! Why didn't they just stick a few extra pretzels in the nugget on the bottom? Wife just bought me a summer treat. No more. They've changed the recipe. Icecream part is insipid. Almost no flavor, which would be OK if the Chocolate had ANY taste whatsoever. Cone is still a standard sugar cone. What have they done with what was one of my favorite summer treats?